Remind readers that Sepinwall is similarly not-reviewing pilots over on his blog and that his opinions and mine are almost exactly the same, but often phrased somewhat differently. 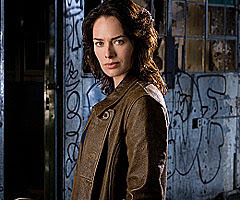 Indicate that complete first glimpses of "K-Ville," "New Amsterdam," "The Sarah Connor Chronicles" and "Canterbury's Law" are after the bump. 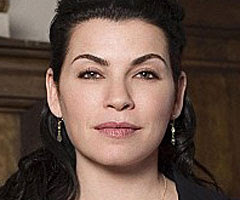 Quick Response: I just don't like police procedurals. I'm sorry. I had to backtrack through three seasons of "The Wire" because I skipped it due to my distaste for the genre. But I love New Orleans. Always have since it was just a hop, skip and a road trip from my Mississippi home. So I love the idea of FOX taking a show to New Orleans and actually shooting in the Big Easy and bringing that money to the region and I love the idea of any show that can actually capture the flavor and texture of the city -- the food, the music, the architecture, the faces. From the pilot, it looks like "K-Ville" does a pretty decent job of showcasing post-Katrina N.O. and in Anthony Anderson and Cole Hauser it has two leads capable of being both compelling and authoritative. But every time I got engaged in the sociological aspect of the pilot, they chose, instead, to waste time on an investigation that I couldn't possibly have cared less about. And several of the key stereotypical baddies from the pilot -- William Mapother's shady ex-mercenary -- could have played out "Wiseguy"-style in a long arc, rather than just getting wasted in 44 minutes here. Desire to Watch Again: Low-to-moderate. I'd like for this show to succeed, for the city. And FOX seems to want it to succeed as well, giving it the post-"Prison Break" Monday slot (a slot that didn't work for "Vanished" last season, but whatever). I'll tune in again. Possible Role For Eric Balfour: I guess he could play a hot-shot N.O. cop with problems with authority. The Pitch: The immortal investigator drama in which the lead isn't a vampire. Quick Response: Another procedural in which I don't care much about the procedure. But there are interesting angles here that I like: A cop who's never left New York City in 400 years will know things about the city that nobody else could possibly know and he'll have reservoirs of knowledge that nobody else could have. It's not that he's insanely brilliant or intuitive like a Dr. House, but the guy's accumulated several lifetimes worth of information. The logistics for how Amsterdam has been able to live for 400 years without anybody in all of his jobs asking him how he stays so darned young will presumably have to be explained. But in addition to piling up 400 years of experience, he's also picked up enough quirks to stifle a dozen drama leads -- he's a recovering alcoholic who loves carpentry, Red Ruffing and one-night stands. Fun. 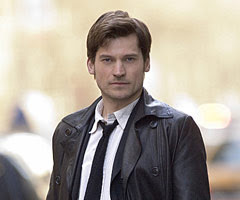 Fresh face Nicolaj Coster Waldau has a great name and an interesting lingering Dutch accent (Sepinwall figures he just can't do a consistent American accent, but I think it's a "choice"). None of the supporting characters are immediately engaging. Desire to Watch Again: Low-to-moderate. I'd bet FOX tweaks this one in a hurry. Possible Role For Eric Balfour: Again, I guess he could play a young, hot-shot cop who doesn't care for authority. The Pitch: Take "The Fugitive" and replace both Lt. Gerard and the One-Armed Man with killer robots. Quick Response: You hear "Terminator" spin-off and you immediately expect a certain scale, but this David Nutter-directed pilot is admirably restrained, so much so that future episodes shouldn't have trouble living up to the premise. Lena Headey can't hope to live up to Linda Hamilton (she doesn't have the guns or the desperate edge of the "T2" Sarah), but Thomas Dekker has the much much easier task of only needing to be as good as Edward Furlong and Nick Stahl, so he succeeds. Without any question, my favorite part of the pilot was Summer Glau, who gets to use the same dead-pan delivery and dancer's grace that made her so popular on "Firefly." The pilot has to rely on all sorts of narrative tricks to establish its place in the franchise mythology, but after watching for 44 minutes, I don't know what the series is. Two hours of watching characters flee from unstoppable killer robots is fine on the big screen, but 13 or 22 episodes per season? And if the series is really meant to be between the second and third features, doesn't that limit the potential directions for John and Sarah Connor to go? FOX should be able to get viewers to tune in at mid-season (expect the advertising blitz to be nearly unprecedented), but will it follow the "Dark Angel" big-launch-big-drop pattern? It'll be up to subsequent episodes to keep fans on board. Possible Role For Eric Balfour: There's always room in a show like this for an ambitious, young hot-shot FBI agent with an authority problem. The Pitch: "House" meets "The Practice" or something. Quick Response: I'm not one of those people who needs a likeable character to like a show, but I have to be amused by somebody, or engaged by somebody or I have to at least respect or admire the way a character goes about their business. "Canterbury's Law" is a murky, gloomy dud that drains several performers I've liked in the past -- Julianna Margulies, Ben Shenkman, Linus Roache -- of any humanity. It doesn't help that the procedural plot for the first episode is full of laughable moments including a climax that goes straight to ludicrous. Mike Figgis gives the pilot a jittery pace, but the whole thing looks like it was shot through a muddy Coke bottle. This doesn't fit the FOX brand, it's a horrible match with "Are You Smarter Than a Fifth Grader?" and it won't attract a single viewer from "CSI" and "Grey's Anatomy." Desire to Watch Again: None. Possible Role For Eric Balfour: I guess Canterbury's team of reckless defense attorneys could use a hot-shot young attorney who can't abide by authority. Fox's development has really been awful the last 2 years. Either that or they've just picked up some of their worst pilots. I'm completely confused as to why they've loaded up on so many procedurals when both of the procedurals they launched last year tanked. And at least Justice was entertaining. I really wish they'd held onto that one until midseason and let it run behind Idol. Even House was a flop until it got the Idol lead-in. I hated New Amsterdam. I want that 45 minutes of my life back. If the accent is a choice, it's a bad one because it is completely distracting.